Congress does not have the power to compel a commercial activity an individual is not engaged in under the Commerce Clause, so the individual mandate to buy government-approved health insurance is unconstitutional. Congress cannot invoke the Necessary and Proper Clause under the taxing power as the source of the power to levy penalties because this is not proper. The amicus brief by the Washington Legal Foundation explains this argument. the new conditions on all federal Medicaid funding such as expanding eligibility, coverage for pre-existing conditions, and mandated services, constitute an unconstitutional coercion of the states as explained in this amicus brief. This argument is given some additional weight by virtue of the fact that a majority of the states have joined in the lawsuit opposing ObamaCare and the federal effort to take over the police power of the states guaranteed in the 10th Amendment. The Institute for Justice has also submitted an amicus brief to the Supreme Court which emphasizes the history of contract law and decisions regarding it made by the courts. William H. Mellor, Dana Berliner, Steven M. Simpson, and Elizabeth Price Foley present the argument that ObamaCare compels individuals to purchase health insurance policies for themselves and their dependents, which requires individuals to enter into contracts against their will. I will paraphrase the amicus brief Summary of Argument section in the three paragraphs below, with an effort to shorten the text somewhat. This individual mandate is the first time Congress has made a law under its commerce power that allows an individual no means of escape from its compelling them to an action. The Founding generation understood that government should not have the power to force individuals to engage in commercial transactions against their will. Commercial transactions imply a contract and a contract has always required mutual consent in Anglo-American law. Contract law would be gutted in its entirety if this mutual consent requirement were disposed of and no contracts would then be binding upon the parties to the contract. A contract would be a concept without meaning. The Institute for Justice amicus brief further argues that if Congress exercised a power to wipe out the doctrine of mutual assent, this would not be a proper action under the Necessary and Proper Clause. Chief Justice Marshall declared in McCulloch v. Maryland that a law was necessary and proper only if the end was legitimate and it was consistent with the letter and spirit of the Constitution. Compelling individuals to engage in commerce ends the concept of contractual mutuality of assent and is not consistent with the letter and spirit of the Constitution. Destroying the principle of mutual assent is the last step in creating a general federal police power to control the lives, liberties, and property of the people and the internal order, improvement, and prosperity of the State. This general police power had been reserved to the States, as stated in The Federalist No. 45 by James Madison. The Supreme Court recently stated in Bond v. United States that the purpose of the Constitution's enumeration of powers and federalism was to protect the individual rights of the citizens. If Congress were allowed to force individuals to purchase health insurance under contract, this would destroy a fundamental precept of contract law and drastically reduce individual liberty. These arguments are all good arguments, but it seems very clear to me that the Founding generation intended the Constitution to provide us with a federal government which was legitimate as defined in the Declaration of Independence. 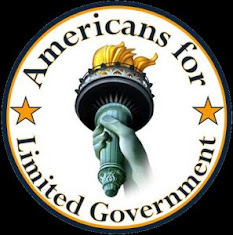 Such a government, strictly constrained in power as the Constitution intended, was to have the purpose of protecting the equal, sovereign individual right to life, liberty, property, the ownership of one's own body and mind, and the pursuit of happiness. My addition of property and the ownership of one's mind and body is to remind today's ahistorical citizen that these rights are inseparable from the more briefly stated life, liberty, and the pursuit of happiness phrase of the Declaration of Independence. The citizen of the late 18th Century knew this. One should be able to simply state the obvious fact that ObamaCare deprives the citizen of life by not allowing him to control his health and medical care as needed to preserve his life and to flourish in it, it deprives him of liberty, it turns the ownership of his mind and body over to a collective, and it denies him the right to pursue his happiness in many critical ways. It clearly violates the 9th Amendment protection of our essential individual rights not explicitly named in the Bill of Rights. 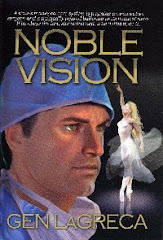 Who then could have imagined that the federal government would try to control everyone's health and medical care. 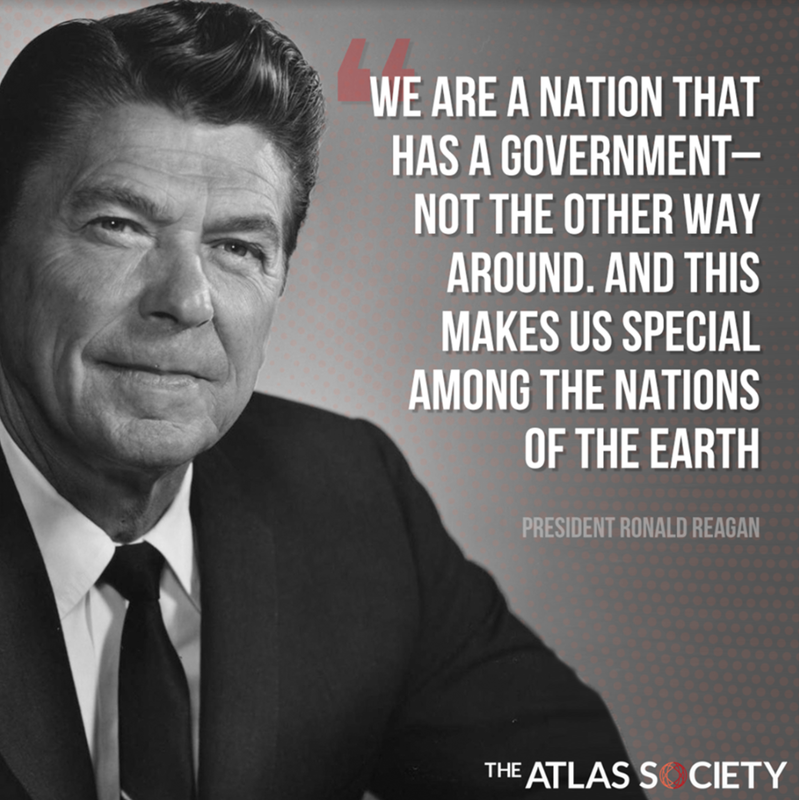 It cannot be more clear that ObamaCare is an individual rights Obamanation, that synonym for abomination. Unfortunately, the modern American cannot hold a candle to the Founding Generation when it comes to individual rights. Even so, ObamaCare is such an obvious violation of the Constitution that 72% of Americans realize that it is unconstitutional. Let us hope that 55.55% of the Justices of the Supreme Court also understand this. We know that at least Justice Clarence Thomas Stands Sure on this, providing Liberty a sure 11.11%. The family motto of the Scot Andersons is Stand Sure. In campaign speech after campaign speech, Obama has said that oil is the energy of the past. This is another example of his dedication to making fallacious arguments. Of course that statement is true, but fallacious has two meanings: 1) embodying a fallacy, and 2) tending to deceive or mislead; delusive. 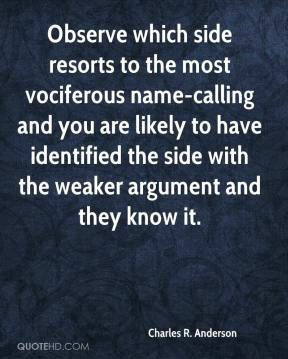 Obama is a verbal magician apparently able to deceive about half of all Americans with his ability to make the misdirection argument. The most momentary thought will allow anyone to recognize that our cars almost exclusively operate on gasoline or the occasional diesel, today. Of course both are oil products. This makes oil the energy of today and some set of our tomorrows. What is more, while Obama would like us to think electric cars will dominate tomorrow, any sane observer doubts they will dominate even in ten or twenty years. Despite large tax credits and a certain political correctness in some crowds, electric vehicles are managing to sell only in the few hundreds a month. Indeed, the as yet mythical 54.5 mpg cars that Obama likes to claim will reduce our oil consumption would not even be needed if electric cars are soon to replace gasoline-fueled cars. If gasoline is going to be challenged, it is more likely the challenge will come from cars operating on natural gas, which has recently become very inexpensive thanks to the economic development of shale oil and gas deposits. 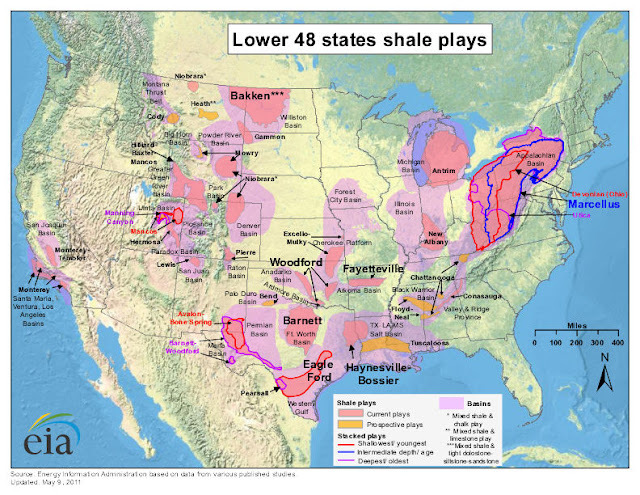 Yet, shale oil deposits will also give prolonged life to gasoline, so it is hardly the energy only of the past. Another mainstay argument Obama is using in his campaign speeches is that the U.S. consumes 20% of the world's oil consumption, but has only 2% of its oil reserves. This is another fallacious argument. Once again, not because these numbers are wrong, but because they are meant to deceive. Oil reserves is a shortening of proven oil reserves. Oil in the ground is not a proven oil reserve until and unless the price of oil is high enough to allow its profitable removal using available technology. As the price of oil goes up, the proven reserves tend to go up. As technology improves, the proven reserves of oil increase. In addition, an oil field has to be developed to a fair extent before there is an accurate enough assessment of how much oil there can be economically extracted with the available technology. The development of an oil field is a very expensive enterprise, so it is generally done only as oil is needed. In other words, it does not pay to prove a very large reserve of oil. Why does Obama make this statement in all of his campaign speeches? First, he is trying to minimize his guilt for the present rising oil and gasoline prices at this awkward time not long before he comes up for re-election. He is making the argument that increasing America's reserves will do little to change the price of oil and gasoline because our reserves will still be small compared to our needs. This excuses his many efforts to slow the approval of drilling permits offshore and on federal lands. It excuses his discouraging risky drilling by increasing the royalties on oil extracted from federal lands and offshore from a level similar to that paid to private landowners to one 50% higher. Contrary to the claims of many leftists, most of the federal lands are not National Parks and are classified as open to oil and gas drilling. Drilling in the Gulf of Mexico in 2012 is expected to be 30% less than had been expected prior to the moratorium according to a recent commentary by Charles Krauthammer. He also notes that leases in federal lands in the Rocky Mountains are down by 70% since Obama has been in office. Less directly, the statement also tends to excuse his denying Americans more access to Canadian oil and easier access to the Bakken Formation oil of North Dakota, Montana, and South Dakota by his failure to approve the Keystone XL pipeline. It tends to excuse his failure to lift the ethanol mandate that only makes our gasoline more expensive, as well as our food. Second, he is trying to use the 2% reserves statement to imply that our oil is almost gone and that makes oil the energy of the past. It justifies his so far fruitless efforts to develop electric cars as an alternative transportation mode. It also justifies his draconian mandate that cars will have to have a 54.5 mpg gasoline efficiency, no matter what the increased cost of the cars may be and no matter how much their safety may be lessened. Let us consider our past proven oil reserve situation. The Energy Information Administration (EIA) gathers oil reserves data by surveying private companies. Currently, these U.S. oil reserves are valued at 22 billion barrels of oil. This is the same as the reserves reported in much of the 1940s. 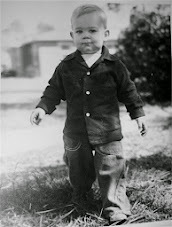 Of course if the oil reserve were the oil in the ground in the U.S., we would have to subtract all the oil we had used from U.S. production since the 1940s and we could not possibly have the same amount of oil left now as we had then. Obviously, there is much more oil in the ground than is given by the oil reserve figure. According to a variety of government data, the Institute for Energy Research has found that the U.S. has at least 1.4 trillion barrels of technically recoverable oil. This is about 200 years of our oil needs without any imports. The actual amount of oil is much higher for several reasons. First of all, almost every estimate of oil in an oil deposit area proves low. Once the field is more developed, it is found that there is more oil than was known early on. For instance, in 1995, the USGS thought there were 151 million barrels of recoverable oil in the Bakken Formation. In 2008, it increased the estimate to 3 to 4.3 billion barrels of oil. Current estimates run as high as 20 billion barrels of recoverable oil there with today's technology. The formation is estimated to have a total of 500 billion barrels of oil, much of which may be recoverable in the future. The earlier estimate of oil in the National Petroleum Reserve in Alaska was increased four-fold in 2002. Estimates of undiscovered oil are another 2.3 trillion barrels of oil. Basically, we are not on the verge of running out of oil. What is more, with the U.S. development of the technology to extract oil from shale oil deposits, many new oil resources will be developed all around the world. For instance, oil shale deposits are known in Poland and in Great Britain. 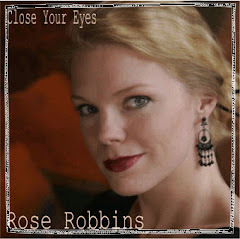 They will be discovered in many other places around the world. We will be able to import oil for a long time from other parts of the world as well as develop our own very extensive sources of oil. The reign of oil for our transportation needs need not be short. Of course, it will be fine if it is displaced by some better technology that is economically justified, but we are hardly in the dire straits Obama misleadingly claims we are in. The man is an evil magician directing our attention away from the critical and relevant facts. The effect on prices of this underwhelming 30 million barrels of oil was, well, underwhelming. Fortunately, over the longer haul, we are very able to extract much larger amounts of oil from within the U.S. and around the world than is being extracted today. This effort, if Obama would only allow it, will keep our oil price and gasoline price reasonable for quite some time. But with his placing offshore and federal land areas off limits for drilling with his super-slow permitting process and his high royalties, his policies will long leave us vulnerable to radical price fluctuations. Of course, he will falsely blame these on the natural scarcity of oil and the nefarious actions of speculators, as all good socialists do again and again. 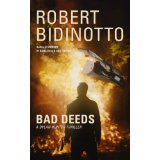 Yet every investigation into the role of speculators shows them to have had no real negative or illegal effects. Good studies show that they in fact tend to smooth out price fluctuations. 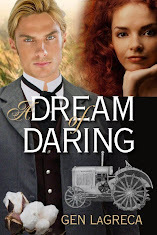 Their purpose is to anticipate changes in supply and demand and to try to see that they match one another. Only those who do not understand the market and supply and demand are readily deceived by this socialist claim that speculators are evil. The opposition media to Obama is irresponsibly and ineffectively performing its job for the American people. Since the government so-called seasonally adjusted unemployment rate started coming down, it has been common to see the Wall Street Journal headline that a jobs recovery is underway. Fox News program hosts have been making the same claims. This is a sad failure of the opposition media to inform Americans of the true situation as the much needed counter-punch to the power-grabbing socialist occupying the White House and his allies in the Senate. 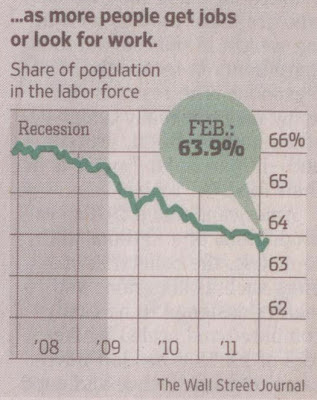 Consider the 10-11 March 2012 issue of the Wall Street Journal: Jobs Recovery Gains Momentum blares the headline. The sub-headline was: U.S. Payrolls Climb 227,000 with Growth Across Industries; Unemployment Rate Holds at 8.3%. Now if this is a gain of momentum in jobs creation, how is it that the unemployment rate remained at 8.3%? So, I find myself totally puzzled about the Wall Street Journal evidence that we are seeing any jobs recovery, let alone one that is gaining momentum. The article does note that the economy has 5.2 million fewer jobs now than it had four years ago. It notes that the growing working age population ought to have many more jobs available than four years ago for the employed percentage to compare with the pre-Great Recession level. It observes that most economists say that "unemployment will remain elevated for years unless the pace of hiring accelerates." Indeed, it is just such acceleration that one would need to see to be able to say that the "Jobs Recovery Gains Momentum." Not only that, but one would need to see that acceleration apply to several months. Apparently fools write the headlines, which are all that most people see. It seems that the economic or business reporters at the Wall Street Journal entrusted with the front page and the headlines just arbitrarily throw things into an article with no understanding of the Big Picture whatsoever. If the News Corporation, which owns Fox News, Fox News Business, and the Wall Street Journal cannot do better than this, it is no wonder the socialists are so often able to wrest control of our government. Even the opposition appears to have no economic judgment of note. It fails to point to the politically and economically crucial facts, so that our economically and business ignorant will become more knowledgeable. This response to the February jobs numbers out of the Bureau of Labor Statistics on the oppositions part is characteristic of their frequent failure to point out the significance of the data to the general public. It is terribly disappointing. If the voter is dumbed down, how will we ever counter the trend to worse and worse central planning by government? 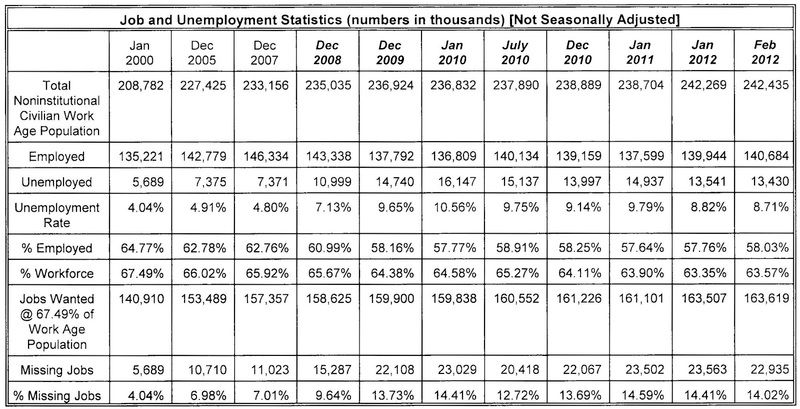 A far more rational evaluation of the jobs numbers, with some perspective on the history during this recession, is given in my earlier post entitled Sick Economy has More Missing Jobs than in February 2010! 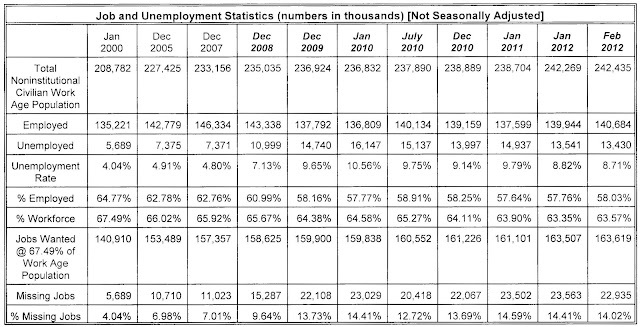 The number of missing jobs, using the non-seasonally adjusted data of the BLS, is almost identical in each of the Februaries of 2010, 2011, and 2012! 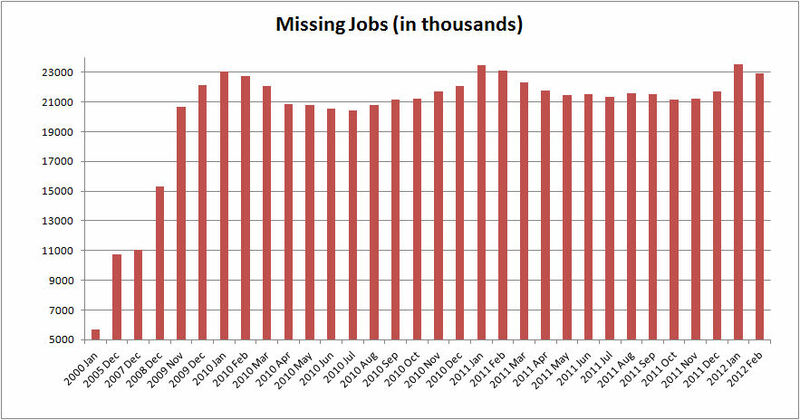 Sick Economy has More Missing Jobs than in February 2010! But to be more precise, there are slightly more missing jobs in February 2012 than there were two years earlier in 2010 and slightly fewer missing jobs than in February 2011. 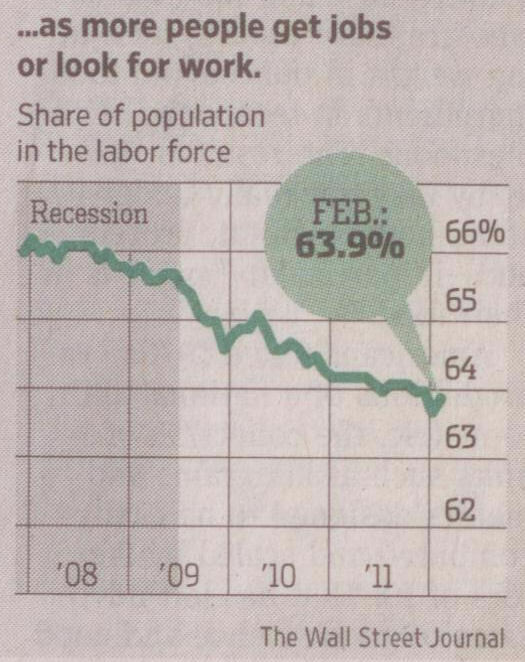 There is no sign of progress in putting the many people back to work who have lost jobs in this Great Recession. The February employment numbers have improved over those of January, but they have done that each of the last two years also and by about the same amount. The real unemployment rate is 14.0%, which is slightly down from the real unemployment rate of January, as is usually true of February unemployment. The unemployment will fall into the summer and then start growing again until it will probably reach a maximum again in January 2013. This cycle is why only the seasonally adjusted unemployment numbers are usually discussed. However, the seasonal corrections made assume that the summer months will see a normal increase in outside jobs, such as construction jobs. But with the housing market so long depressed and there being no real prospect that housing and commercial construction will be at normal rates this coming summer, there is no real justification in making a normal winter size correction to the January and February employment numbers. In general, recessions will not behave in accordance with normal seasonal corrections and this is even more likely to be a problem in such a uniquely long recession. As I have explained many times, this recession is one in which government policy has been very effective in prolonging the recession. The incredible level of uncertainty that Obama and his Democrat fiends have produced has very effectively suppressed gross private domestic investment to unheard levels and held that investment down for a very prolonged period. Without that investment there will be no significant job creation. Jobs lost in the early part of the recession in huge numbers cannot be recovered without much improved private investment. There is little likelihood of a significant improvement in business investment anytime this year, since Obama and the Democrats intend to stick to the wrongheaded policies that have deepened and prolonged this recession. If many of the 23 million Americans without jobs are to have them before too long, Obama and the Democrat-controlled Senate, which cannot produce a budget even, must be replaced. Throw these rascals out so millions of decent Americans can earn a living once again! I do not often mention Paul Krugman, whose mind must be highly compartmentalized if there was any justification for his winning a Nobel Prize in Economics. In a 6 March 2012 commentary called John Galt Wants Price Support, he defamed my friend John Galt in a doubly underhanded way. The first instance is a failure to judge the character of New York financial businessmen objectively and honestly. The second was to use a limited time-history of economic data to misdirect his readers attention from the Big Picture of our economy and the effects on it that have caused this very extended recession. 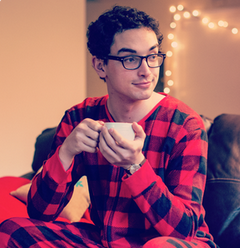 He performs an act of shear dishonesty for a very partisan, non-defensible socialist viewpoint. Let us examine his argument. Krugman refers briefly to a Bloomberg article by Max Abelson about how Wall Street financial people are suffering lower income and having to cut back on their spending. One of the problems faced by many of the Wall Streeters were their concerns about being able to keep their children in private schools. Given the state of the city public schools, this is a concern to be taken seriously. Second homes, expensive cars, expensive pets, and many things most people view as luxuries were concerns. He then cites one Mike Konczal who claims that the interviewed Wall Streeters are whiners. Konczal says they are "rentiers, angry that their wealth isn't yielding the return they want." Konczal complains that these Wall Streeters have no business complaining about the Federal Reserve keeping interest rates incredibly low for years. For some time, the bank lending interest rate has been set at zero and we are told it will continue at this rate into 2014. Krugman then opines that these John Galts of Wall Street want interest rate price supports. I do not doubt that numerous Wall Street financial people would be very happy with interest rate price supports. New York City is a Democrat stronghold. I am also sure that many would see the danger and would reject the idea. But Krugman here is doing the equivalent of lumping all of the businessmen in Atlas Shrugged together and observing that Orren Boyle and James Taggart want government price supports and announcing that therefor Hank Rearden and John Galt also want price supports. This obviously is an argument that would not fly with anyone who has read Ayn Rand's Atlas Shrugged, but it is made in order to keep people from reading Atlas Shrugged and to denigrate all of its many enthusiasts. 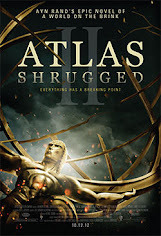 For the sake of anyone who has not read Atlas Shrugged: Orren Boyle and James Taggart are villains who constantly advocate business-government partnerships that restrict free trade, while Hank Rearden and John Galt are heroes of a very moral character who believe in a very limited government and a robust private sector with little government interference. The time periods marked are those in which the US GDP contracted, so they are the last two recessions by that definition. As I have noted, a better measure of the period of a recession is the period of time in which the real per capita GDP is in a lowered state. By that criterion we are still in this recession. 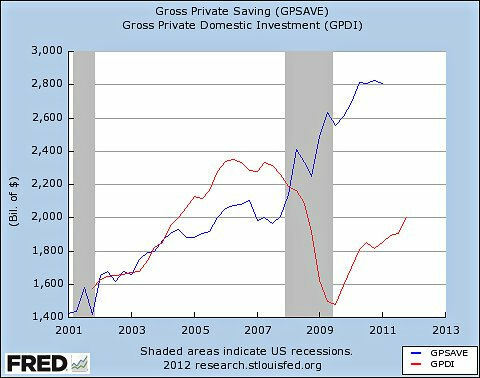 Now Krugman has us looking at this savings and investment data over the last few years in which we see the gross private domestic investment exceed the gross private saving for a few years and then dip down well below it as the recession took effect. Once well into the recession, many more savings dollars are available to be used in investments to make money than are being so used. As a result, returns are low. 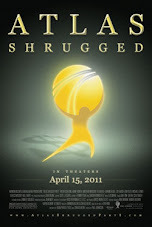 He calls this a problem of excess savings and because he is a Nobel Prize winning economist, many accept his authority. Examining these charts, we see that both have long-term increasing curves with larger variations in the investment curve than in the saving curve. 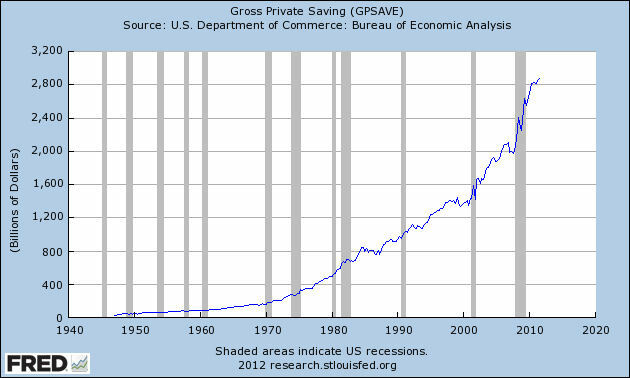 The Federal Reserve monitors the gross private savings and it plays a major role in the Federal Reserve effort to keep the money supply increasing at a steady and controlled rate. The gross private domestic investments will be a result of the gross private savings and the judgment of businessmen on the risk of investment. The risk of investment is heavily affected by actions of the federal government such as new laws (ObamaCare, Dodd-Frank Too Big To Fail, increased minimum wage), new or changed regulations (FDA, EPA, FDIC), and new or threatened taxes (taxes on medical devices, drugs, and clinical tests under ObamaCare, financial fees under Dodd-Frank, increased oil and gas royalties, threats of new taxes on wealthy and oil companies). Krugman made it much harder for his readers to observe that it is usually the investments which are problematic. He also hid the fact that one of the most distinguishing marks of this Great Recession is that it has had a much, much bigger effect on reducing investment than any of the other recession periods since WWII! 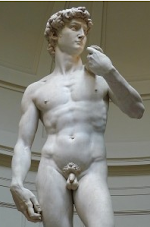 Why did he hide this? Because Krugman is a hack propagandist for big, socialist government and he does not want his readers to see how disastrous the federal government's policies have been in creating business uncertainty and a situation in which businesses can no longer see a way to make a profit in all too many potential investments they may evaluate. Krugman is hiding the fact that this recession, as with others, requires a renewal of private domestic investment if there is to be a recovery. Looking at the chart, the investment decrease from its bottom has recovered to only about 60% of the pre-recession level. This discounts the fact that over a normal four-year period the level of investments would rise quite a bit. Indeed, it needs to increase by about 4% just to keep up with population growth. Krugman also claims that the Federal Reserve has done savers a favor by setting the bank lending rate at zero. He seems to imply that it might set it at some negative rate. In any case, a zero rate may help a segment of the financial market, but it hurts many others in that market. Over a period of time, it also tends to generate investment bubbles that then become a great danger for many investors and lenders. 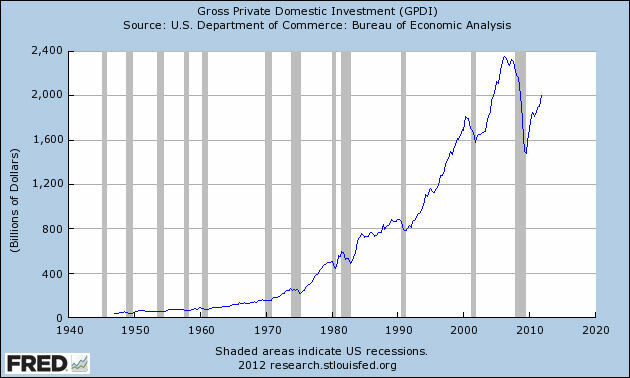 Lowered gross private domestic investment causes a slow rate of GDP growth or worse. This contributes mightily to the real per capita GDP failure to recover from the recession. When a Nobel Prize winning economist tells you the problem is excess savings, Krugman is lying as badly as he was when he told us that Orren Boyle is really John Galt. This man and the publications, such as the New York Times, that carry his column are not worthy of being taken seriously. Long ago I realized the irony that the Blue States heavily subsidize most of the Red States with the money they pay in federal taxes. A Progressive Elitist, Sara Robinson, has somewhat cleverly used this to imply that the richer, more productive Blue States are being charitable to the mooching Blue States and they should Go Galt on the Blue States until the bigoted, backward people of the Red States are suitably grateful. Her article is entitled, Ayn Rand Worshippers Should Face Facts: Blue States Are the Providers, Red States Are the Parasites. Her argument is worthy of some thought, though she is way over the top in her VERY SUPERIOR condescension toward the people of the Red States. In that she is so childish and ill-informed that I will not bother to discuss her broad characterizations of the people of the Red States. 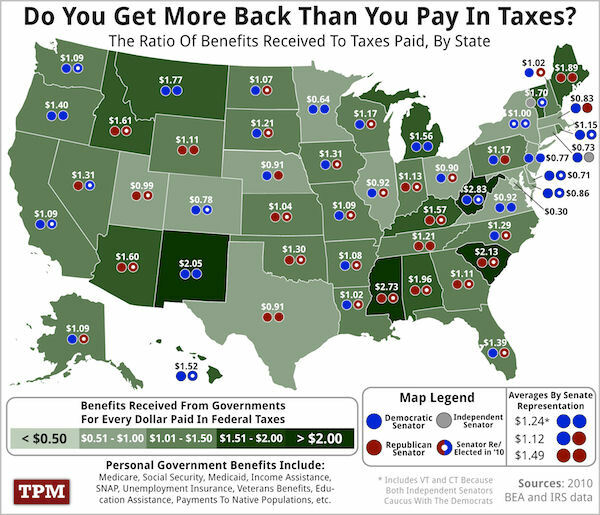 For the most part, the Red States do receive more in benefit payments than they pay in taxes and most of the Blue States pay more in taxes than they get back in benefits. Part of the reason for this is that population density is higher on the East and West Coasts and this has trade and commercial benefits of itself. The East Coast is the longest settled area and has had the easiest trade ties to a long wealthy Europe. The Southeast was destroyed by the Civil War and had been too rural and slave-dependent even before that. The Northeast first developed manufacturing on a major scale and the principal financial centers grew up there. The nation's capital is also on the East Coast. All of these factors helped to make the Northeast a wealthy area early on. The West Coast became much wealthier during the military build-up of WWII and then continued to have trade advantages with Asia thereafter. It definitely deserves praise for its development of many high technology businesses in the last several decades. To address the issue of whether the Blue States really are more productive than the Red States, however, we should actually look at the Per Capita Income by State. In 2010, those numbers are well presented by the Tax Foundation here. By my reckoning, I identified 26 states as fairly reliable Red States and found that 10 of them were ranked among the top 25 states in per capita income. Four of the Red States are in the top 10 states by per capita income. It also tends to be the case that the cost of living in Red States is lower than that in Blue States. Lower state and local taxes and fewer expensive state and local laws and regulations help to make a dollar go further. Some costs such as land costs go down simply because many of the Red States are less densely populated. Generally, housing costs are lower. The cost of doing business is often lower also. Meanwhile, Blue Staters are paying slightly higher tax rates on their federal income taxes because of the progressive tax rates. Their meaninglessly higher incomes suffer a larger fraction of tax loss due to the foolish idea of using fixed tax rates across the entire country. Correspondingly, many benefits are given out on the basis of income, so the lower apparent incomes of Red State people is more likely to induce a flow of federal money to them. These effects actually are not avoidable, but the problems can and should be minimized by minimizing the federal government. The end result is that it is not entirely obvious that somewhat higher per capita income in the Blue States means that the people of the Blue States are actually more productive. It is not clear that money changing hands more rapidly actually means more productive work was done and more was actually accomplished. One can use a lot of energy spinning one's wheels, as is all too evident in many socialist countries. But, for the moment, let us allow that the Blue States may be slightly more productive, albeit maybe owing in good part to locational and historical advantages. There is no question that the Blue States giving up more in taxes than they are getting back in benefits are draining their private sectors of wealth. Thus they are suffering a real handicap to business investment and are retarding their future GDP growth. The people of these states are lowering their standard of living. More specifically, Harvard Business School professors have published a study of the effects on a state when a Senator or a Representative is moved up to being the Chairman of an important committee for appropriations. The study, Do Powerful Politicians Cause Corporate Downsizing?, covers a 42-year period and found that these committee chairman were able to deliver large sums of earmarked or other money to their home states. In the year following the ascendancy to a chairmanship for the 232 instances studied, the state had a 40 - 50% increase in federal earmark spending, a 9-10% increase in total state government transfers, and a 24% increase in total government contracts. The professors, Lauren Cohen, Joshua Coval, and Christopher Malloy, expected businesses in the state to benefit from the pumped up economy, consistent with what most Keynesians would expect. Boy, was that ever wrong! Instead, they found support for simple neo-classical model in which individuals trade work for more leisure when faced with government spending. Increased resources from the government that are not expected to be funded by taxes or borrowing induce individuals to increase their consumption and leisure. The resulting decline in the marginal productivity of capital compels companies to scale back investment and output. Focusing on the investment (capital expenditure), employment, R&D, and payout decisions of these firms, we find strong and widespread evidence of corporate retrenchment in response to government spending shocks. In the year that follows a congressman’s ascendency, the average firm in his state cuts back capital expenditures by roughly 15%. These firms also significantly reduce R&D expenditures and increase payouts to their investors. 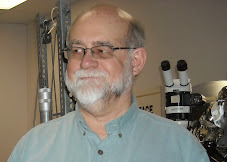 The magnitude of this private sector response is nontrivial: in the median state (which receives roughly $452 million per year in increased earmarks, federal transfers, and government contracts as a result of a seniority shock), capex and R&D reductions total $48 million and $44 million per year, respectively, while payout increases total $27 million per year. These changes in firm behavior persist throughout the chairmanship and begin to reverse after the congressman relinquishes the chairmanship. We also find some evidence that firms scale back their employment, and experience a decline in sales growth in response to the government spending shock. There is every reason to believe that such general effects upon companies will have similar effects upon the green energy companies. Joshua Coval says that these negative results applied to the average firm, large and small firms, and within the industries that are the target of the spending. Some of the government money hires employees away from other firms. He also believes that this money contributes to added uncertainty due to government involvement. He says the results indicate that government spending does not stimulate private economic development. Thus, what we find is that however charitable the motives of the Blue States may have been, their largesse to the Red States has a most malevolent effect! The Red States often have a better business environment relative to the state government, but that business advantage is often offset by the negative effect of having Senators and Representatives who are too good at bringing home the bacon. The Red States would be well-advised to make it clear to their Congressional representatives that they want them to vote against all spending increases by the federal government and that they want them to make every effort to cut back on present government spending. 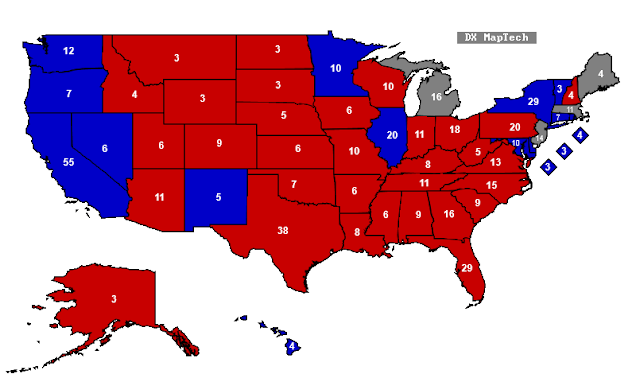 Contrary to the VERY SUPERIOR Progressive Elitist Sara Robinson's call for the Blue States to GO GALT until the Red States cry Uncle, both the Red States and the Blue States would be very well served if the Blue States were to GO GALT! I do not actually believe the Blue States were that charitable in intent. Too many people there (here for me) really do want to live under socialist government. The cost to them of doing that is to bribe the people of the Red States who do tend to want more freedom with government handouts aimed at getting their politicians to go along with them. The Red States especially have a bit of a political advantage in the Senate due to their states having smaller populations on average. This is why the Blue States pursue the growth of more government very vigorously and the Red States complain a bit, but are generally willing to go along at a preferred slower pace. For instance, the road infrastructure funding bill before Congress now is receiving the votes of almost all of the Democrat and Republican Senators. Only 11 are lined up against it. Seven of them are Republicans and four are Democrats up for re-election from states that are basically Red States. It is long overdue that the people of both the Red and Blue states understand that these money transfers across the country are only hurting themselves, without any beneficial effect at all. We badly need more federalism, with much less government from the national level. Then the Red States will prosper much more and the Blue States will at least suffer a little less. By all means, let us have all of the states Going Galt. ObamaCare, the infamously misnamed Patient Protection and Affordable Care Act, is a compendium of jokes upon the American People. Of course, a bill so long that hardly any Congressman who voted for it had read it and which had been hastily assembled is bound to have many surprises in it. One of these now turns out to be the fact that the 'Louisiana Purchase' that won Mary Landrieu's vote for it in the Senate and was supposed to have provided an additional $200 million to Louisiana for its Medicaid program, was actually written into the law as an additional $4.3 billion. According to the law, Mary was to get 21.5 times the amount originally reported to the public. The error is claimed to be a typo, but I am having a great difficulty in seeing the similarity of $200 million and $4.3 billion. It is hard not to believe that sometime more nefarious was afoot here. The Democrats clearly have a huge disrespect for the American People. This law tells us we are incompetent to take care of our own health. It tells us that our bodies and minds belong to the collective, whose control will be exercised by government central planners who have no need to know us as individuals, any more than the lawmakers had a responsibility to know what they were voting for. The controlling central planners will be of the same set of people who drafted this incredibly wrongheaded and incompetent law behind closed doors in the first place. The tragic jokes on the American People will just pour out month after month unless this tragic law is repealed. It is far too big a mess to be fixed piece by piece. It is not funded as advertised and the central linchpin for it provided by the individual mandate to purchase a government approved health insurance plan is clearly unconstitutional. The already unsustainable Medicaid and Medicare edifice has been made still less stable by the addition of ObamaCare. How ironic that Democrats pretend such an interest in the sustainability of energy use and the environment, but care so little about the sustainability of government and its most heavily funded programs. In some recent posts on US energy use and gasoline costs, I have made the assertion that the government policy of providing large grants to such so-called green energy companies as those marketing wind, solar, and car battery technologies is actually hurting our economy and contributing to the high cost of energy. This assertion is probably puzzling to some. There are many people, both on the Democrat and the Republican side who are advocating an all of the above policy by the government to develop every possible source of energy. This is wrongheaded. In some cases such spending has made it more fashionable for the various state governments to mistakenly require the electric utilities they regulate to use more and more wind and solar or other alternative energy sources with a damn the expense and the reliability attitude. When wind and solar require an 80% of capacity back-up power plant fueled by coal or natural gas to stand by waiting for high demand and low wind or low solar irradiance moments, these already expensive sources of electricity become still more expensive. They also become operational nightmares on the electric grid. First Solar is often said to be a well-run company, but having good management and the best product is often not enough to create a market adequate to the required investment, even with government loans and grants. Many of the companies above actually appear to have been created in order for Obama supporters to cash in on his election. These companies figure in heavily in those companies that have gone bankrupt, often just after paying out large bonuses to some managers. Each of these companies does represent a mal-investment or misdirected investment by stockholders and owners, of business and engineering talent, equipment, and materials, which has been heavily encouraged by the government. These very valuable resources could have been put to better uses and likely would have added more to the future GDP without any waste of taxpayer money paid now or in the future. This misdirection of resources has added considerably to business uncertainty and affects the willingness of investors and loaners to invest in businesses, especially innovative or high technology businesses for the future. There is a phenomena known as crowding out. If government borrows money, as it has done to fund its green energy initiatives, some people understand this money will have to be paid back with future taxes, so they save more money for the future. In addition, when government borrows money, it makes it harder for businesses to borrow money to invest in what they believe will be profitable investments. Government borrowing may also be partially enabled by loans from other countries, such as those the US has been getting from China and elsewhere as we have recently accelerated our deficit spending. This means our national income will be depleted in the future to pay these loans. The end result is that the money the government has borrowed to pay for its many poorly performing green energy investments contributes to a long-term reduction in GDP growth for the country. 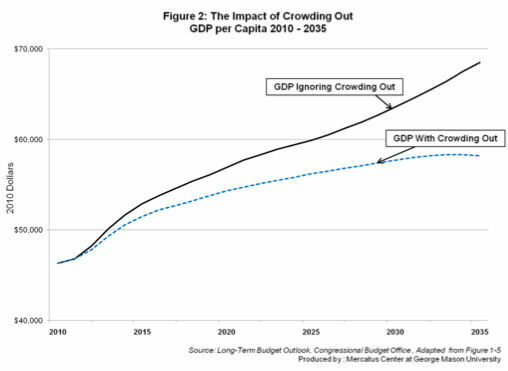 A recent study by Matthew Mitchell and Jakina Debnam for the Mercatus Center of George Mason University called In the Long Run, We're All Crowded Out, shows a major decrease in per capita GDP going forward due to this crowding out effect. The effect shown in the chart is based on all government borrowing, but that due to green energy expenditures is also having a negative impact on our per capita GDP, further offsetting any wished for benefits from developing green energy. One has to conclude that Obama's program to develop green energy as a major contributor to Americas future energy needs is counterproductive. It is one more indicator of his wrongheadedness about economics and business. In the longer haul, he is likely not only doing great harm to the economy in general, but he is surely doing harm to our future with having inexpensive and reliable energy sources. He is also likely to be doing a great deal of long-term harm to the wind, solar, electric vehicle, battery storage, and geothermal energy industries. Each of these industries has profitable niche markets, but none of them is ready for prime time yet or likely in the near future. When the time is right for each of these industries, if ever, to develop in a more major scale, the private sector will see to that they do develop. At this time, R&D funding by the government is less harmful than the funding of ramped up production, which is clearly premature and doomed to failure. But even R&D, especially when ramped up sharply as Obama is doing, is very wasteful. 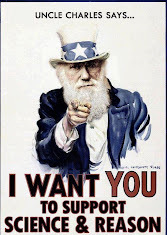 The development of technology and science is not just a function of man-hours invested. 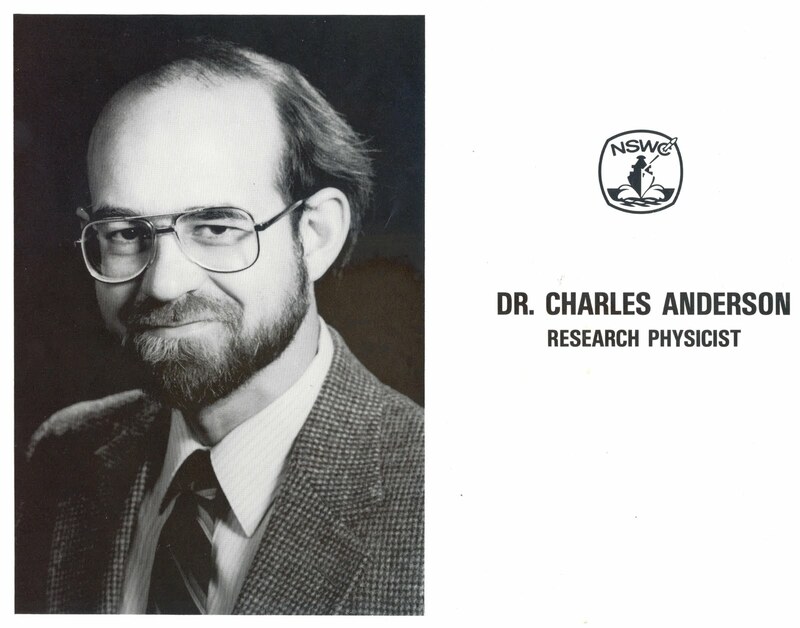 It takes a man about 10 years to become truly expert in a field. If money is thrown rapidly at a field of R&D, too many of the people in the field are relatively new to it and there is a lack of expert leadership and experience. It also takes time for advances in one narrow field to receive feedback from other related fields or technologically needed fields. Trying to short-cut the time for the optimal use of manpower and other resources is very wasteful. The best way for government to have any beneficial impact on green energy R&D is to fund it steadily at a level commensurate with the actual results being produced for an extended time. That is if it should be funding such R&D at all. But what is clear is that the present program is about as wrongheaded as it gets. This is most typical of Obama and his supporters. Still another major problem with the big Obama push for green energy use is the fact that it is a distraction from the very effective solutions to our energy needs to be found by doing the many things the private sector can do very well for us on its own, if allowed. For my list of important actions to free the private sector, please see my last post, US Oil Production and the Price of Oil and a recent post, The EPA's Newest Environmental Vendetta Against Coal. Overall, Obama's policies are increasing the cost of energy and the cost of living. One of the claims we are hearing repeatedly is that it does not matter if US oil production and distribution is restricted or allowed to flourish by the government because oil is priced in the world market and variations in the US supply cannot affect that price. Let us examine this claim. Why does OPEC exist? It was created to restrain the oil production of its member countries to help keep the cost of oil on the world market high. All of the OPEC countries are countries that use only a small fraction of the oil they produce and are heavily dependent upon the price of the oil they export for their national GDP and for government revenues. If relatively modest changes of oil production and subsequent export did not change the price of oil significantly, there would be no value in OPEC at all. Now OPEC does face a number of limits on their control of the market price. One is that when the price goes up substantially, the individual members of the cartel begin to cheat or to lobby strongly to export more oil to earn more tempting dollars. Another limit is that much oil is produced in countries that are not OPEC members, so they will ramp up production of existing oil fields. They will also put more effort into finding new oil fields and developing them. Furthermore, when the price of oil goes up, people start conserving oil more by using it more efficiently and by switching to other fuels to some degree. It is also the case that rising oil prices often cause worldwide recessions and these recessions lead to less oil use. In fact, recessions usually cause oil prices to drop, though economic activity is commonly decreased by only a few percent. These actions are not good for the income of the OPEC nations. They all indicate that oil prices are sensitive to supply and demand. The next 13 oil producers are rich in OPEC nations producing from 1.2 to 2.8 mbpd of oil. Uncertainties about Iran due to recent efforts to place embargoes on it and its threats to close the Straits of Hormuz have contributed to the recent rise in oil prices. But China and India are already the two biggest oil importers from Iran and they are not willing to join an oil embargo. To the extent that oil prices are not sensitive to oil supply changes, these nations continuing to take Iranian oil ought to leave the oil price less subject to change. The top 20 oil producing nations produced about 67.3 mbpd in 2011 and about 33.4 mbpd of this was by OPEC nations. If an embargo not including China and India were to take place on Iranian oil, at most 1.6 mbpd would be the drop in the world oil supply. This amount could be made up by the other OPEC nations if they were so inclined, but if they were not, the price of oil would rise significantly. Indeed, Saudi Arabia could by itself produce much more oil and if the price of oil were not sensitive to its production, it most probably would. For sure, many of the other OPEC nations would produce more. How much more is mostly a result of how low they are willing to drive the cost of oil. If oil prices keep going up, they all make a killing even at current production levels. Somewhere there is a formula for maximizing their profits based on the price, the amount of OPEC production, and world demand for oil. One of the problems we have had in the US is that Mexico and Venezuela, along with Nigeria, have been among the biggest sources of oil for our many large Gulf of Mexico oil refineries accounting for 40% of our total oil refining capability. The other large source is our offshore oil production in the Gulf of Mexico. The state run oil companies of Mexico and Venezuela have been producing less and less oil for several years now. Oil production in the Gulf of Mexico by the US has also fallen sharply due to restrictions on drilling in the Gulf placed by the Obama administration and the decline of existing oil field production there. To import enough oil to make up for these losses, the oil refineries have to pay world market prices and haul it in from greater distances from the Middle East. Meanwhile, we have a relative surplus of oil piling up in Cushing, Oklahoma at the main terminal for our oil pipeline network due to the oil flowing there from the Alberta tar sands and the North Dakota Bakken oil shale formation. That oil is a boon to the oil refineries in Oklahoma, Illinois, Kansas, Wyoming, and Montana which are tied into the interior oil pipeline network. They have been able to buy oil at a price $15 to $20 a barrel less than the world market price. These refineries cannot use the supply of oil operating at full capacity. This is why Enbridge is reversing the direction of an existing pipeline that carries oil from Cushing, OK to Houston, TX and why TransCanada has decided to go ahead with building the new pipeline segment from Cushing to Houston that was part of the Keystone XL pipeline project that Obama has delayed and delayed. That segment does not cross the border, so it does not need approval by the State Department and Obama. This example of our own local oil supply exceeding the refinery capacity it can get to, is clearly an illustration that more oil production is not entirely lost in its effects on prices. Obama is claiming that the increase in mandated for automobile gasoline mileage to 54.5 mpg will decrease oil demand and have an impact on lowering gasoline prices. This is true when, if ever, such mileage increases occur. But if reductions in oil use in the US affect prices, then so do US increases in oil production. It is contradictory to think otherwise. There is an interesting historical event when George W. Bush was President that implies that oil prices are partially a function of future oil price expectations. On 15 July 2008, Bush ended an executive branch moratorium on oil and gas exploration and development on the outer continental shelf offshore. The price per barrel of oil very quickly fell from $149 to $136. Bush then asked Congress to end a moratorium it had put on the development and exploration of oil in the outer continental shelf. Order Energy Secretary Steven Chu to stop telling everyone that we want gasoline prices to match those in Europe at $8 to $10 a gallon. Stop telling everyone that that is his long-term goal, gradual or not. Repudiate this as a goal, ever. Announce that he no longer wants a cheap dollar and will therefore stop unprecedented deficit spending. The price of oil largely follows the value of the dollar. Just after his State of the Union address, he asked that a 50% royalty be added to all energy production on public lands, making it equal to that for offshore areas. This raised the royalty from 12.5% to 18.75% and greatly discourages drilling there and encourages the early abandonment of wells as their production falls off with age. Approving the Keystone XL Pipeline from Alberta will very substantially increase our oil supply and will allow that oil to be delivered inexpensively and reliably to our huge complex of Gulf Coast refineries. Open up more ANWR areas in Alaska so the Trans-Alaska Pipeline can be kept operational. Stop the glacially slow approval rate for drilling permit applications. Only 3.7 deep-water permits in the Gulf of Mexico have been approved per month since August. In the prior 3 years, 7 applications were approved on average a month. Obama has about doubled the time for environmental studies on applications. Stop demanding that oil companies be taxed more aggressively than any other extraction industries are and recognize that drilling for oil and gas is a very risky business. It is also a business that many thousand companies participate in, contrary to the myth that only Exxon Mobile and a few other behemoths are in the business. Most of the innovations that have swept the industry and allowed it to extract oil and gas where that was not possible years ago have been developed by these smaller companies. Allow the states to be the primary regulators of oil and gas production inside their boundaries. 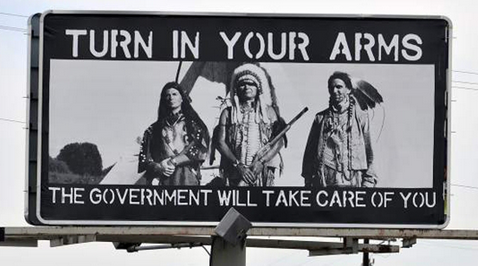 They know more about their land and the needs of their people than the central planners in Washington DC do. Stop wasting taxpayer money on alternative energy sources and misdirecting the efforts of so many energy businessmen, technical people, and scientists in these expensive, unreliable, and at best very long-term alternatives. The private sector will build such industries when they are capable of being economically sound. Understand that the oil companies want to extract oil and gas responsibly. BP is losing about $40 billion due to their mistake in the Gulf of Mexico. Companies have to have learned from that. Indeed, they have to be responsible on land as well, especially since their increased oil and gas production has been mostly on private land and private landowners have little tolerance for someone messing up their land. Private landowners are generally much better land managers than the government is. Make it easier to build new refineries, especially in the northern Great Plains states, such refineries would have a good supply of oil from Alberta and North Dakota and Montana. The East Coast is actually losing oil refinery capability and that is causing local prices to go up. Gasoline prices are locally sensitive to the local demand relative to the local refinery output. End the pointless ethanol mandates that push the cost of gasoline up substantially due to the high cost of ethanol and added blending and distribution costs. End the penalties on refiners for not blending in cellulosic ethanol in particular, since there is no commercial supply of this form of ethanol and the cost of the penalties has to be passed to the consumer. This requirement for using cellulosic ethanol is a great example of the Obama penchant for the unreal. In short, it could not be more nonsensical than to claim that increased American oil production has no effect upon prices. It has both long-term and immediate effects. This fact is well-known to Obama and his advisers. They have proposed restrictions on the development of American sources and Canadian imports of oil specifically for the purpose of driving up the cost of oil and gasoline. By driving up these costs, they said they could reduce our use of oil and reduce CO2 emissions. Now they argue an insensitivity of supply on costs because of the deleterious effects of rising gasoline costs on the upcoming election. After the election, they will revert to the earlier argument that restrictions on oil field development, oil distribution, and refinery capacity are needed to drive up the cost of oil and discourage its use. The United States has enough oil and gas reserves that it now knows how to extract economically that it can have a marked impact on the world market price of each, especially gas. We have a very good opportunity to switch substantial segments of our transportation industry to using natural gas, thereby cutting down on our oil demand. But even in oil, we can raise the supply significantly sourced within the US and its offshore waters and by allowing much more Canadian oil to be piped to us. 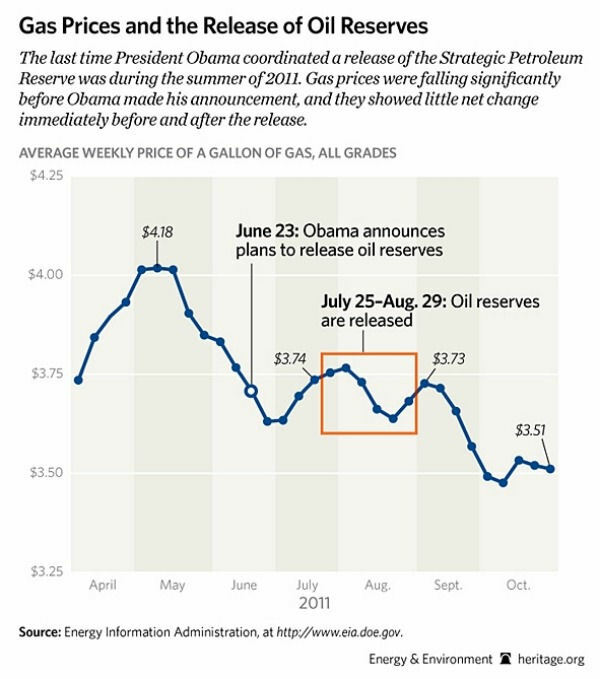 The U.S. has increased its oil production, no thanks to Obama, by 11.3% from 2008 to 2010 and further in 2011. Canada increased its oil production by 5.9% from 2008 to 2010 and continues to increase it. Most of Canada's oil is exported to the U.S. Given that global demand for oil from 2010 to 2011 increased by only 0.8%, these American and Canadian increases in oil production are significant and would have kept our prices low, had it not been for the constant uncertainty that Obama so much loves to create for our businesses. Despite some leveling toward world market prices for oil, these increases in oil in the US and Canada have allowed our gasoline prices to remain much below those in most of the world. In addition, unleashing the oil, gas, and even coal industries will put many more Americans to work in those industries and supporting them, will reduce a major business cost for manufacturers, reduce energy costs for individuals and families, and will put more people back into jobs generally as the economy will be favorably affected. It will even produce more revenue for governments. The federal governments second largest source of tax revenue after the income tax is oil and gas royalties. That would help to reduce those horrible government deficits that are causing the value of the dollar to fall rapidly against commodities, such as oil. In a recent post I noted that growth in the GDP was very anemic for a recovery period following a recession and actually for most any time. I also noted that per capita GDP was not increasing unless the GDP grew faster than the population did. I stated that taking this into account made the GDP growth we have seen look abysmal. The situation is even worse than I then indicated. 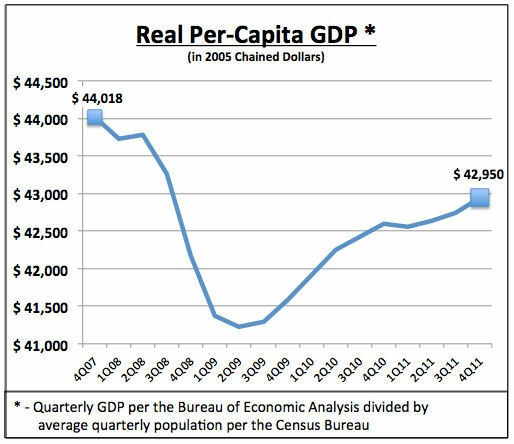 I have found the graph of the real per capita GDP in an article by Tom Blumer entitled Slow 'Recovery,' Dire Consequences. Tom Blumer points out that Warren Buffet noted in September 2010 that we were in a recession until real per capita GDP was back to its pre-recession level. So, if you examine this chart you can see that we are still in recession and there is a number associated with the average pain. Of course the real unemployment rate of above 14% should not be forgotten as well, since some people are in more pain than others. The bottom of the recession was the 2nd Quarter of 2009 when the real per capita GDP was about $41,250, or about $2,768 less than the pre-recession real per capita GDP of $44,018. In the 4th Quarter of 2011, we had recovered about 60% of the loss at the bottom of the recession. We still have a long ways to go to be whole again. Of course with a real unemployment rate of more than 14% and many people underemployed, it would be surprising if the real per capita GDP were not still depressed. Tom Blumer also provides another set of useful numbers if we wish insight into why we are having such anemic growth. In the 4th Quarter of 2007 before the recession hit the USA, but after much of the rest of the world was in recession (despite The Economist's 25 February issue re-iteration of the false claim that the USA started the worldwide recession), the total real GDP was $13.3260 trillion and all government expenditures were $2.4553 trillion, leaving only $10.8707 trillion for the private sector. The corresponding numbers for the 4th Quarter of 2011 show the total real GDP to be $13.4224 trillion and all government to be $2.5076 trillion of that. This left only $10.9148 trillion for the private sector. So, the private sector real GDP grew a very anemic 0.41% over the course of four years or at an average rate of 0.10% per year. The US population grew at a pace of about 0.97% a year from 2000 to 2010, so when expressed in per capita terms, the productive private sector GDP provides less per person in the growth of the economy. There are many other reasons for concerns about the economy. The rising costs of gasoline and diesel fuels will surely retard growth. The even worse recession in Europe is a drag on exports. The expiration of the 2011 100% write-off of capital goods expenditures to a 50% write-off in 2012, has resulted in a decrease of durable goods orders in January. Orders were down by 4.0%, much more than most economists had predicted. In fact, the very fact that so many of them were badly wrong is a reason for concern. The only area of growth in durable goods was cars, trucks, and parts, so of course Obama has touted just that area in his speeches. He has little to say about a general drop in transportation equipment orders of 6.1% with a particularly nasty drop in civilian aircraft orders. Generally, business investment in equipment was down in January. This does not bode well for business confidence or for further healthy increases in productivity.